For some time past, vessels had been threatened by "an enormous thing": a long object, spindle-shaped, occasionally phosphorescent, and infinitely larger and more rapid in its movements than a whale. Then, Captain Nemo decided to allow his submarine, the Nautilus, to be drafted into service on a hunt ahead of its time. (It should be noted, to begin with, that the narrator of this version is Frederick Davidson, NOT Alfred Molina.) It's not Frederick Davidson's fault, but the translation chosen here is the worst of many Victorian hatchet jobs that were done on Verne's prose. For example, in the second chapter, the narrator speaks of returning "from the disagreeable territory of Nebraska." What Verne really said was "from the Badlands of Nebraska." About 25% of the original novel is missing in this translation, sometimes suppressing Verne's politics; Verne's careful calculations are recalculated in slapdash fashion; and mistranslations abound. (In one chapter Captain Nemo refers to a small island which he "would have jumped over" if he could. In Verne's original, he says which he "would have blown up" if he could.) You will get a LITTLE something of Verne in this, and it may remain an entertaining story, but it's not the real thing. Unfortunately, all other unabridged recordings I'm aware of use the same translation. What did you like best about 20,000 Leagues Under the Sea? What did you like least? This is a visionary science fiction story - Verne's ability to imagine what could be done with an up-and-coming technology like electricity is brilliant. And I really like how he weaves that ultra-modern (at the time) technology into the old classic tale of the sea. What was most disappointing about Jules Verne’s story? The most disappointing part of this story is...the story. The vast majority of the story - excepting the first few chapters and the last few chapters - is completely bereft of a plot. It is one endless travelogue, listing the sights and wonders they see around the world. And that frequently descends into such tediously pedantic lists of plants and animals that I just want to yell "get on with it!" Oh...and the other disappointing part is the characters. All of the characters in the story are cardboard cut-outs with no depth or humanity. Captain Nemo is the inscrutable loner. Arronax is the man of science. Conseil is his devoted servant. But none of them are anything more...interesting. With no interesting characters, and little plot, to drive the story, I frequently found it dragging. My favorite part of the book is the beginning chapters, as Prof. Arronax speculates as to the nature of the creature that has been sighted, and then the chase aboard the Abraham Lincoln. Do you think 20,000 Leagues Under the Sea needs a follow-up book? Why or why not? Certainly not. This book is a work of its time; it would not make sense to try to follow it up. I purchased this audiobook because of the narrator, David Chase. He did not disappoint. His reading brought life to this book - even to some of the tedious lists of the types of fish and plants they saw on their journey. It is an excellent narration. this was one of my favorite books of all time it was amazing I loved it. Good story, well worth it. An oldie but not a goodie. The story is extremely tedious. I guess I remembered some action in it, but no. If you are an oceanographer, plant or animal biologist it may be interesting. Given it's reputation in classic scifi, I had high hopes for this, but was greatly disappointed. The narrators voice was annoying (gravelly and pompous) and the voices of the side characters were even more annoying and laughably fake. The story plodded along at a snail's pace and got bogged down in detailed descriptions that had no bearing on the plot. It took unnecessarily long to get to the "under the sea" portion, and once there, almost every chapter contained at least one 5 minute long listing of plants or fish. You could probably condense all of the interesting portions of the book into half an hour and the story would be just as coherent. I am a science fiction fan through and through, reading Isaac Asimov with my father and greatly enjoying the universes of Tolkein, Sanderson, etc. I thought I would like 20,000 Leagues. Maybe I still will in print form, but this audiobook was unbearable. I tried reading 20,000 Leagues Under the Sea when I was in high school, after seeing the movie, but it was just to full of plant and animal classification. The audio version is great, because you can speed up or totally skip those parts and concentrate on the story. Performance could have been better, especially Captain Nemo. This is an excellent recording of a classic. The tone and speed of the reading was excellent. Of course the novel is a renowned classic. I highly recommend it. What can you say about a classic? I really enjoyed The Mysterious Island, so when I saw this I thought I would enjoy it as much. I was always intrigued when I saw the movie of this title, but I didn't enjoy the audio book as much. A wonderful story beautifully narrated. 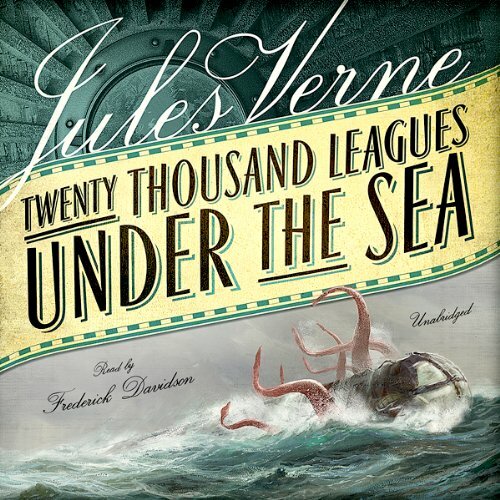 The un-abridge version is, however, not for the faint hearted as Jules Verne seems to list every fish plant or mollusc in the sea. If, however, you love biology you will love this book otherwise the abridged version may better suit!